Fundraising is a full time job! This last week has been mental! The project is coming along nicely and I am really enjoying seeing the pledges increase ever so slowly but surely. The pledges are almost at the half way point so here is hoping for a few more this week. I’ve just registered for Cancer Con in Denver at the end of April but I will not be able to go if I do not hit the $9000 target – pledges only become donations when the target is reached. Looking forward to YSC Summit in just under 4 weeks in Houston. 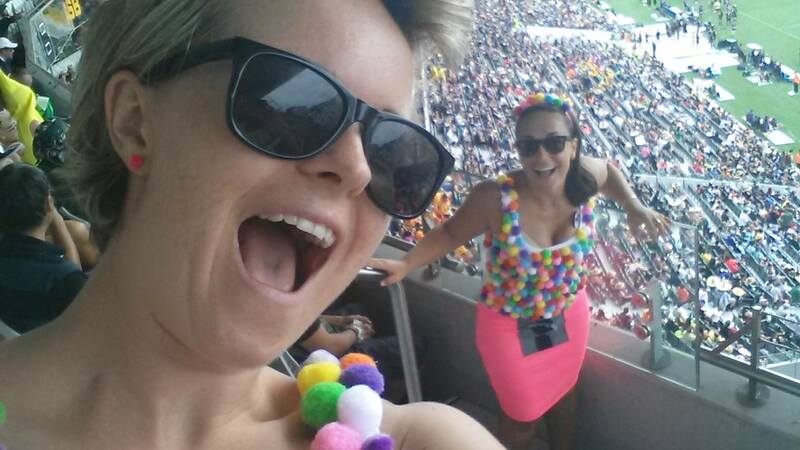 Got to check out the Auckland Nines last weekend which was fun times with the lovely Ange. Always fun to dress up and attend sporting events. We went as Gumball Machines. Wonderful to catch up with Tash, Troy, Sarah and the Welshy crew. Fundraising is a full time job all on it’s own and I feel like I need an extra pair of typing hands to keep up with all the emailing I’m doing. Some wonderful people and organisation’s have been helping me spread the word so that’s been just awesome. Massive thanks to these amazing people and organisations for helping me spread my message via social media and for their belief in my project. Articles have been published in the Western Leader and on the Auckland University Faculty Education website this past week. Big thanks to Chloe Johnson and Sarah Roberts. Feeling pretty supported to by the wonderful organisations in New Zealand who have done so much for people with cancer. Really stoked to have the support of the New Zealand Breast Cancer Foundation and the Cancer Society as well as the wonderful support charity that has helped me in my journey Shocking Pink. Looking forward to working with these organisations in the future. 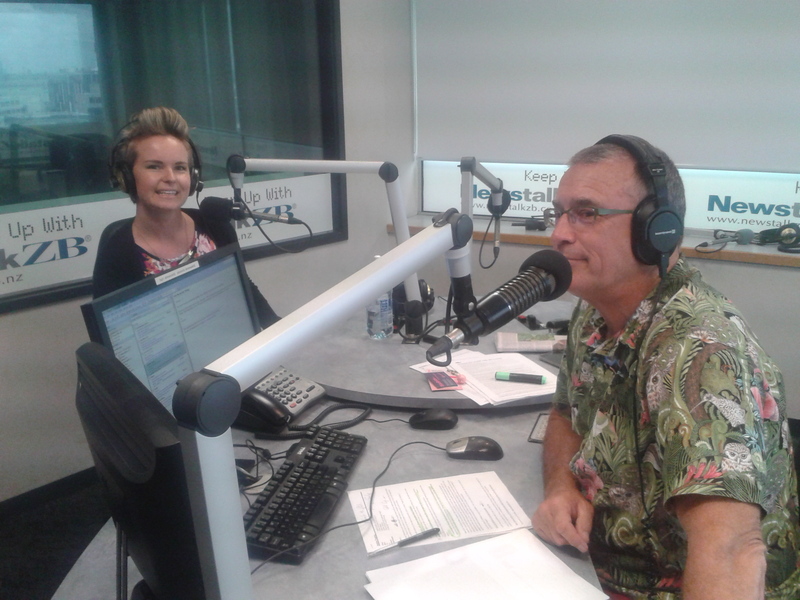 Being on national radio this week with Danny Watson on Newstalk ZB was a pretty big highlight. So amazing to chat to listeners calling in. Big thanks to Danny and the show’s producer Andrew for having me in. Buzzing! I have decided to start a public Facebook page so please start following me via the link to keep updated with what I am up to. Same with the blog. If you want to keep updated please follow my blog. Click on the link scroll down to the bottom of any page and click the green follow button. I checked out Domain Lodge this week which is the Cancer Society center in Auckland. I’m looking forward to spending a bit more time there in the coming weeks and getting back into some mindfulness and stress reduction habits. They run a lot of workshops and seminars for people who are on the other side of treatment and obviously they support people going through treatment and offer accommodation. The library is a really lovely space a there is a lot of good information and books on all kinds of cancer. Such an amazing facility. There are some exciting things happening this week. Still loving the consistent weather and long may it continue, pretty happy to have a tan again! This is the script for my Tedx Talk titled “How Cancer gave me Purpose”. Each section comes with an image which has it’s own story, hense why I am here to do what I do best – explain and tell you the story. The video editing was not as good as I would have expected so it is important for me to explain the imagery so that you can better connect with the message of my talk. Enjoy. A year and a half ago I was 27 and I was on the adventure of a lifetime. I was living in London and I had a permanent smile glued to my face. I was so excited to be starting a new chapter and had recently moved to the UK from New Zealand. I had just taken my first trip into Europe and several were soon to follow. Travelling, exploring and experiencing different cultures wasn’t just an addiction for me, it was my happy place. I was truly living my dream and I loved my life. I was a normal Kiwi girl and as a teacher there were so many opportunities for me to share my passion for learning with those who would become my students. I was fit, active, healthy and I had no worries. The world was my oyster. 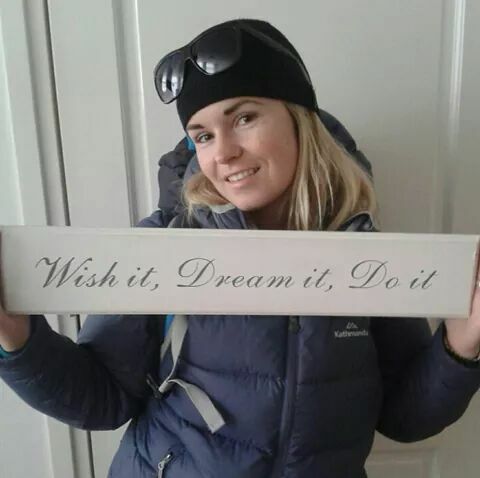 Dream It, Wish it, Do it. The image was taken in March 2013 in Amsterdam. It was my first trip into Europe. This image was what I defined as my happy place and I keep the picture on my bedroom door to remind me of that place where I wanted to go back to. The sign I am holding became my manta along with the quote “Life is either an extraordinary adventure or nothing” – Helen Keller. Eight months later I was having my 7th round of chemotherapy and with one to go I was on the edge of exhaustion. My body had been stripped of anything good by the sophisticated poisons that had been put through my system. I was pushing myself to the limit working full time as a teacher and I was trying to live the dream I come to London for. It was a challenge I was struggling with. I’d lost all my vanity. My golden mane long gone and the side effects of cancer treatment made me ask myself: When will I ever get back to my happy place? I was lost, frustrated and I felt like I was in a dark tunnel with no light to be seen. Two weeks after Mum had left this was my 7th round of chemotherapy – Friday the 29th of November, 2013. So close to the end but so far knowing that I still had Herceptin to endure till the following October and Surgery and Radiation lay ahead. My body was exhausted and getting up in the mornings was beyond difficult. My joints and muscles were stuck and motivation at this point was the lowest. I was diagnosed in June 2013 with an uncommon form of aggressive Breast Cancer. Just before my period my breasts had both became painful and hard. My left breast felt like there was a hard ball of gristle trapped inside. It was a 3cm tumor. It was a sentence that I never ever thought I would hear.” I am sorry to tell you that the test results have come back showing cancer”. It was at stage three when I discovered it and I was informed I had saved my own life as I had caught the cancer in its early stages. I knew something was wrong because it wasn’t normal. Now that I can look back, I am so grateful that I listened to my body. This is what I called bad lumpy. On the 3rd of June, 2013 I went to the Whittington Hospital in North London and this was what was seen on an screen after having an ultra sound. 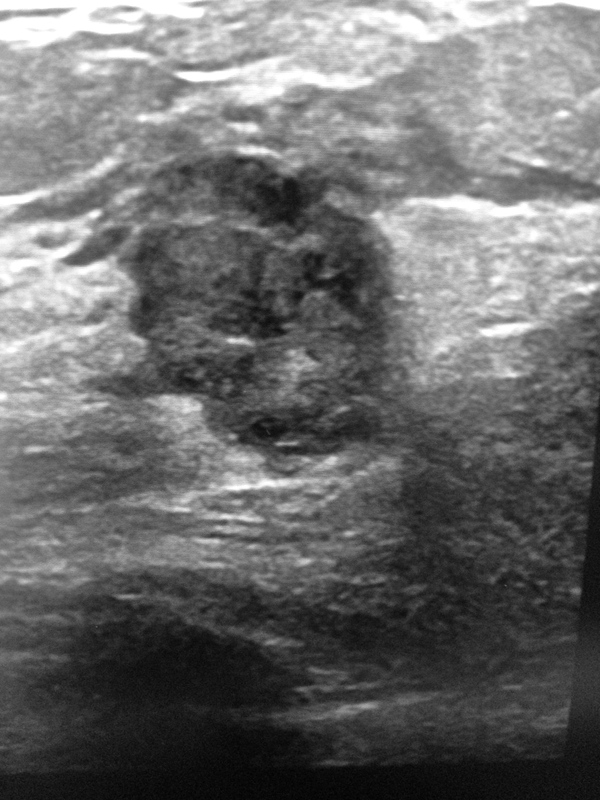 Core needle biopsy on the spot, a 3cm growth. A week later I was given the news. Breast Cancer. It was complete information overload. I was overwhelmed and I couldn’t comprehend what was about to happen to me. I was on the other side of the world and the dream I was living was shattered. Without a choice I was going to get an education about breast cancer. My lack of knowledge was alarming. I knew nothing about this disease and it was something that could kill me. I discovered breast cancer is the most common cancer in women worldwide but it’s not just women that are at risk; it’s men too with around 400 men a year diagnosed in the UK alone. I still question myself – how did I not know this? I wrote down and I asked as many questions as I could and after every appointment I kept a reflection journal. I found solace in writing. 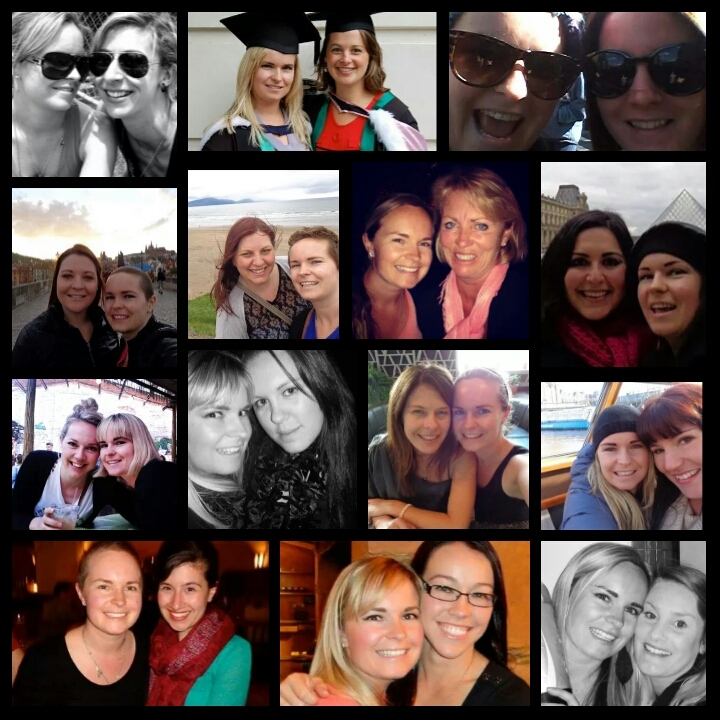 I managed to find a large network of women here in the UK and in NZ that were in the same situation as me sharing their breast cancer experiences. These networks opened up a wealth of knowledge that I am so thankful for. Unfortunately though there are too many of us out there. I was scared. But I wasn’t scared that I had cancer, I was scared that I didn’t know about it and I was even more scared that I didn’t know what it was doing to my body. So many people I have met and spoken too are saying that they are scared of cancer too. It’s the fear of the unknown and the lack of knowledge that fuels this fear. Cancer is not something to be afraid of but according to CRUK getting cancer is the number one fear of the British public. The day I was diagnosed – 10th of June, 2013 I went home and a pile of information and sat on my bed and cried. I read a bit then cried, then read and when nothing went in I cried some more. The amount of information was overwhelming and I didn’t know where to start. Getting diagnosed with an illness I knew nothing about was by far the hardest learning experience I have had to go through. I had to adjust, be open minded, trust my intuition, ask questions and take one step at a time. Google was a no go zone. By the time cancer was out of my body my fuel tank was completely drained. I was broken. However slowly and surely I started piecing my dream back together. I was finding my happy place again. Laughing helped the healing process and I think in situations like these you have to learn to laugh at yourself. It truly is the best medicine. As a teacher I still wanted to be as involved as much as I could be in my lessons. One day I had the opportunity to take a PE lesson in gymnastics. I decided it would be a good idea to demonstrate a forwards roll. Without thinking I got down and propelled myself forwards. Of course my wig fell off and 25, 7 and 8 year olds stood before me absolutely mortified. I’ve never had a class of children so quiet! I did my best to laugh it off. The most amazing thing about that lesson was that not one of those students said anything, except one girl. Miss, why don’t you have any hair? she asked. In the most honest and appropriate way I could my reply was: “I got really sick and I lost it all”. That was a turning point in my healing process and a catalyst to uncover the unknown and break down the fear that surrounds cancer. With so many curious people asking questions, talking about my experience was what gave me purpose. Without realizing I was teaching people I knew and complete strangers about breast cancer. Finding this purpose gave me so much determination to heal and I was able to harness the power of that purpose when I changed the thinking of others. Not that long ago I met and spoke to a young lady who was a Kiwi living the travelers’ dream just like me, struggling to grab her attention. I asked her what her age was. When she replied 27, I explained to her that I was in her exact same position as her a year and a half ago. Until I got diagnosed with Breast Cancer. I watched her face change in an instant and there was a moment where we looked at each other and I felt sorrow and heartache looking at me. The words “You just really made me think” made me feel like I had passed on information that could potentially save her life. Getting a hug of gratitude and thanks from a complete stranger creates incredible soul satisfaction and makes me realize day by day I am on the right path. 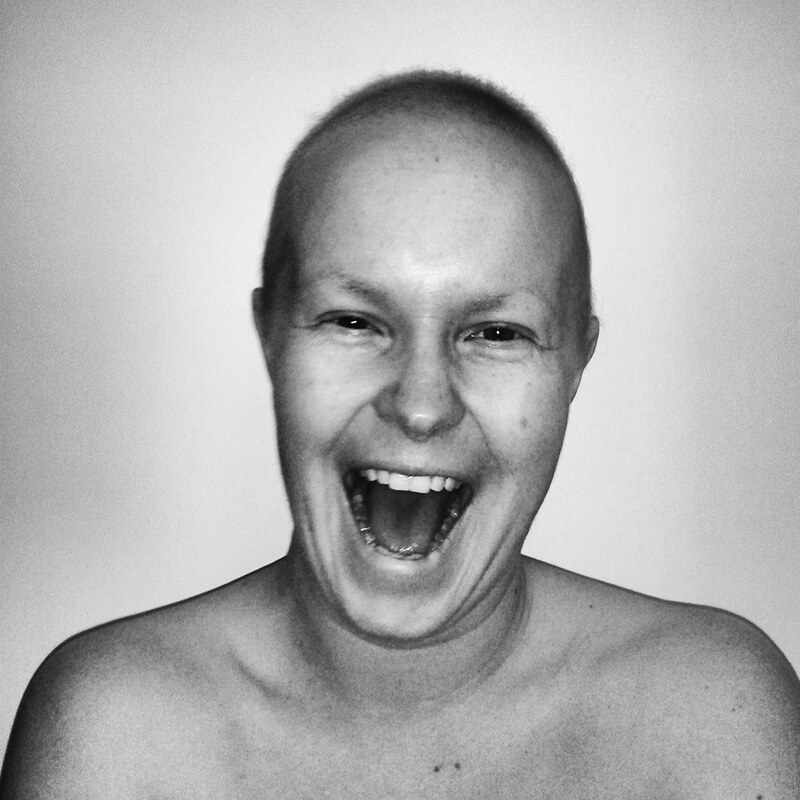 The day I was cleared of Cancer – Monday 10th of February, 2014. I had surgery on Thursday the 30th of January, 2014 and they had managed to remove the cancer with clear margins. My flatmates Imogen and Catherine religiously helped me to take photos of my hair every week to progress the change in growth. This was a completely candid shot where Imogen and I were having a laugh about something silly and the shot was captured. By far one of my favorite photos. Happiness, achievement, health. I never knew I could get breast cancer at such a young age. In fact since I was diagnosed I can say that Breast Cancer should not be classed as a disease of older women. I did not know there are as many as eight signs and symptoms to look out for. When it comes to your breasts knowing what normal looks and feels like could one day save your life. We often don’t take on board information until someone close to us or we ourselves are directly affected by something as serious as cancer. It should not be like that. There are so many awareness messages out there. While we probably don’t take much notice of them the breast cancer catch phrase “Early detection is your best protection” was something that popped into my head soon as I noticed pain in my breasts. It is recommended that we should be checking our breasts once a month around the same time every month in order to notice changes. I did not check my breasts before I got Breast Cancer. I hope one day there will be a cure for this disease but for now prevention and awareness education is our best shot at early detection and reducing the numbers of those getting diagnosed. I managed to document the Cancer treatment process throughout. 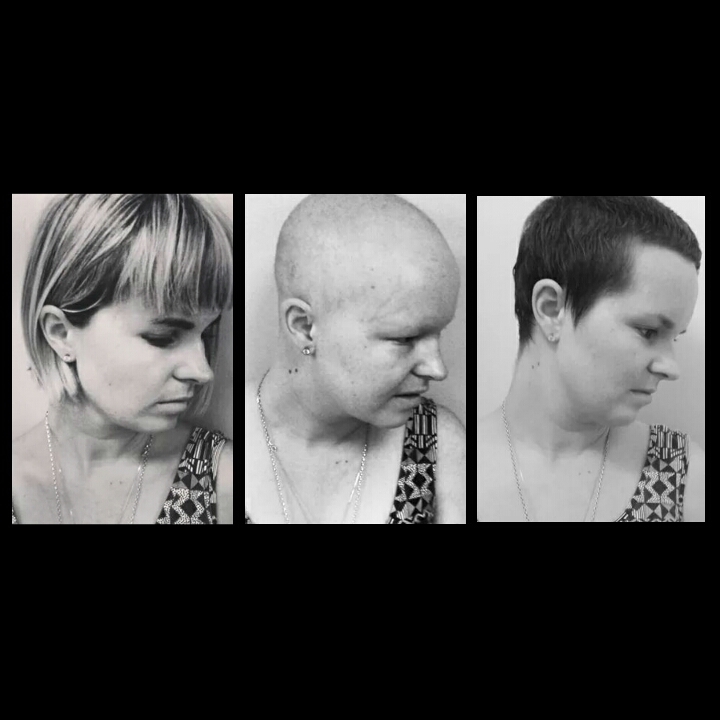 These images show me at the beginning, end and five months out from treatment. They are all five months apart. 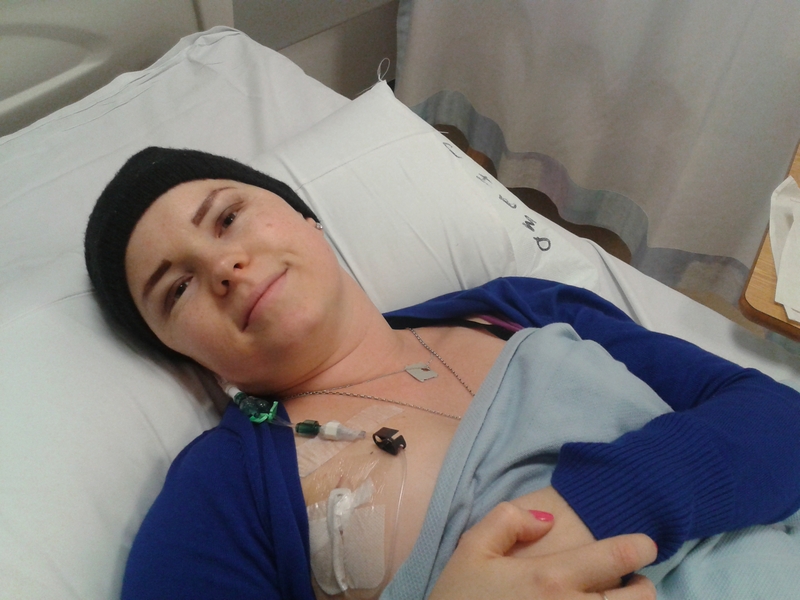 From left to right – First round of Chemotherapy, three days after my 26th birthday – Friday 26th of July, 2013. 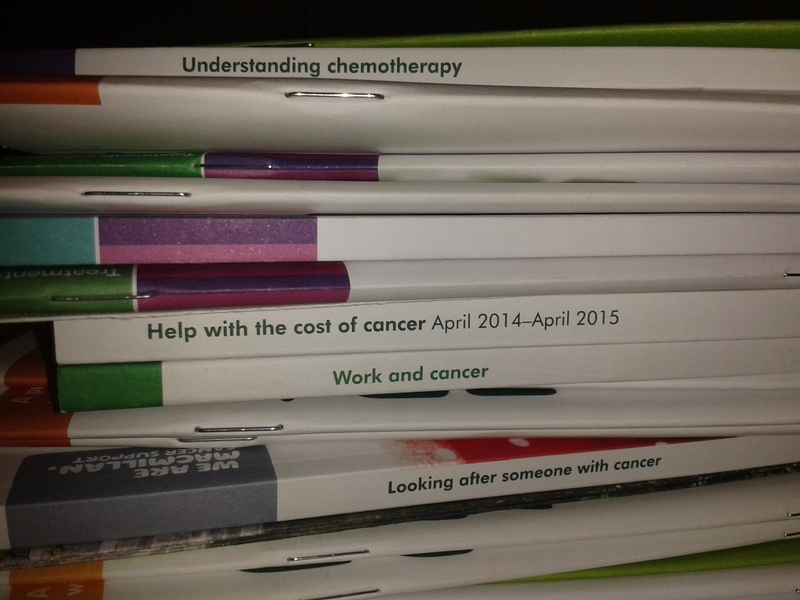 At the end of chemotherapy in time for Xmas – Friday 20th of December, 2013 and 5 months later Friday 23rd of May, 2014. When I put these pictures together I could not believe the change. I was shocked, but I was also in awe of the capability of the human body to heal. As I end this talk. It is important for me to highlight the importance of sharing our experiences in order to learn from one another. We all have a story to share and in doing so we are granted the ability to change the thinking of others. Having Breast Cancer and the experience of it has pushed me to harness the power of purpose, which constantly enables me to inform and educate as many people as I can to prevent them from being in the same predicament as me – especially the people who are my nearest and dearest. Hold onto what I have said and keep it as a reminder to look after yourself and those you most care about. As a new adventure begins for me, it is up to all of you to be more aware and mindful as the prevention of Breast Cancer is literally in our hands. These are images of me with my nearest and dearest before, during and after cancer treatment. 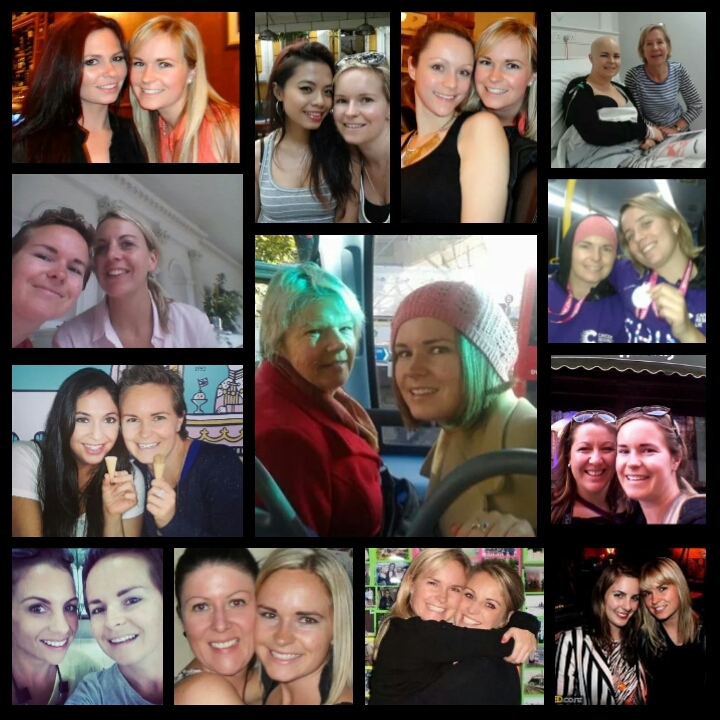 Family – my mother and my cousin as well as my closest friends. These are precious moments and I know that sharing my story has not just impacted my life but theirs too – in ways that are so positive. Each and everyday I am inspired to do what I am doing for them and the rest of our society. This is what love is. To all my friends and family I can’t thank you enough for all your support. There are so many of you to thank and you all know who you are. My Lovelies and Princesses, without you I do not dare to think how life would have been. You opened up your arms and welcomed me and stood by me in the times that were the worst. True friendship is tested in these kind of circumstances and with all of you I have never felt such unconditional love and support. You are all amazing, remember that. Vivienne, by far my Kiwi Mum in London. Without you I would have been lost. With you I was protected and cared for and you always had my best interests at heart. Your friendship means the world to me. To Zahra, I thank you for the opportunity of being able to do this talk. Your belief in me, my message and my purpose. To you I am forever grateful. What motivates you to share an experience? If my situation was the opposite would you be more likely to share it? If I had been misdiagnosed or mistreated would that make you angry enough to tell others? So that it would not happen again to anyone else? We live in a world where the media is constantly negative. I no longer read or watch the news because of the bad energy it brings. Good stories and news that have the happy ending or an inspiration within them are less likely to be shared because we are often more likely to remember the bad consequences and how it could happen to us. If it’s inconceivable we share it. My story happens to be the making lemons out of lemonade kind of story. It could happen to any one of you, Cancer does not discriminate. I was just lucky that I listened to my body at the right time. We need to share so there is more awareness out there and the rates of early detection are increased and the numbers of those diagnosed is reduced. Me having Cancer was a bad thing but I turned it into something that has more positivity and happiness that I have ever experienced. I am not glad I had Cancer but I would never take back the experience. The last two years, despite being the sickest I have ever been were the best two years of my life. It has given me strength I never knew I had and a determination to live beyond the limits I have had in my life. Knowing that you have all learnt from my experience, that is what I call inspirational. We all have a story to share. I need you to help share mine so I can help as many people as I can. At this point I am asking each and everyone of you to share this with anyone you know who can help and anyone you know who may have credibility when it comes to having contacts especially in places like Twitter and Facebook. Got any celebrity contacts that may be keen to tweet my link? I am not doing this for self promotion, I am doing this for the lives of New Zealander’s and young people who should know more about this disease. I do not want to see young people going through this when they should be living their dream. Please share with all those you care about and be sure to pledge to my project if my purpose touches your heart.